A simple average of the five most recent opinion polls shows that the Bharatiya Janata Party (BJP) and Aam Aadmi Party (AAP) are locked in a dead heat in the 2015 Delhi state election, with a projected 40% share of the vote each. There is considerable variation among the five polls in terms of the vote gap between the two parties. 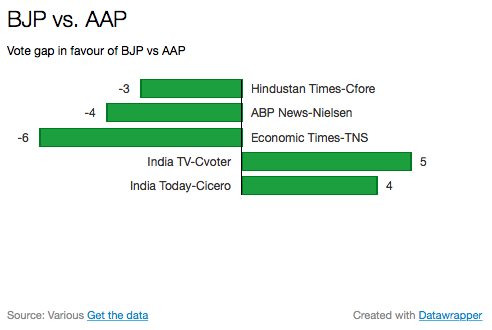 The chart above shows that the BJP is 4-5 percentage points ahead of the AAP in the India TV-Cvoter and India Today-Cicero polls, but 3-6 points behind in the other three polls. How to judge? 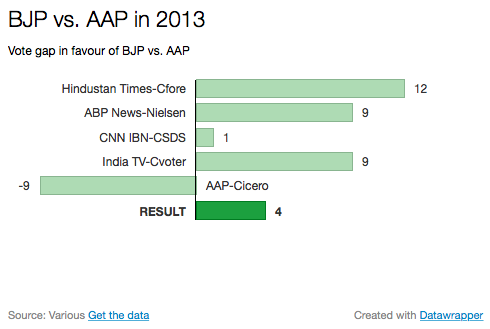 As the chart below shows, in 2013 ABP News-Nielsen and India TV-Cvoter came the closest to estimating the relative vote shares of the BJP and AAP (using the “Mosteller 5” method, explained here); CNN IBN-CSDS did even better but are not conducting a pre-election poll this year. And what do those two agencies together project in 2015? 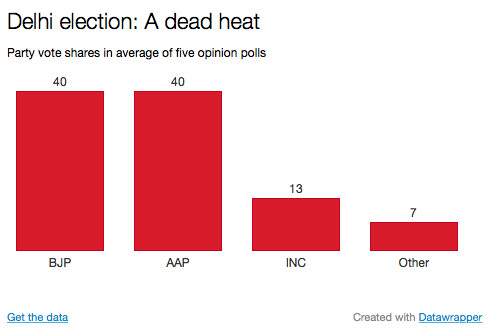 A vote gap in favour of the BJP of -4 and 5 percentage points, respectively, which more or less cancel each other out. Which is why even a weighted average (by past poll accuracy) of the five polls results in — you guessed right — a dead heat.